Satyajyoti Kanjilal, Amitabha Dey, Bibhuti Nath Bhatt, Rajarshi Biswas, Deepa Gandhi, Subrata Pandit, Avinash Narwaria, Chandra Kant Katiyar. Background: Ayurveda is being practiced from ancient time to modern era emphasizes promotion and preservation of health and cure of the disease. It focuses on various lifestyle measures and dietary modifications for keeping a healthy body, mind, and spirit. The aim of the study is to understand the various attributes of Ayurveda useful in lifestyle management. 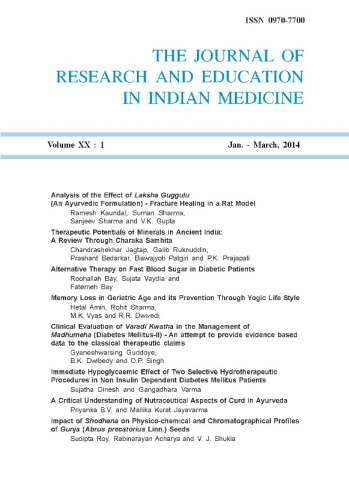 Material and Method: The literature study of this review is based on various databases search such as Science Direct, PubMed, Google scholar, Ayurveda texts and books on ethnopharmacology. Results and Discussion: Ayurveda lifestyle concepts such as dinacharya, ratricharya, ritucharya (practices for daytime, night and seasonal) and dharaniya-adharaniya vega (suppressible and non-suppressible urges) help maintain health. The theory of triupasthambha i.e. aahara (diet), nidra (sleep), and bramhacharya (celibacy/ control on sexual sense) comprises supporting pillars of life. Asatmendriarthasamyoga (improper and harmful conjunction of sense organs with their respective senses), pargyaparadha (behavior contrary to wisdom) and parinama (time/different season) leading to diseases by their atiyoga (excessive use), ayoga (no-use) and mithyayoga (wrongful use). These principles help to develop a guideline to prolong a healthy active life. Ayurveda lifestyle guidelines referred thousands of years ago is useful for promotion of health in the current scenario. It is an important tool for lifestyle management.